and toddler gifts, and gifts for mommy-to-be too! Enter code CM0902, and receive 10% off your order through 12/15/02. Unique novelty items for gift giving all year round. "Believe us when we say these are not your parents coffee mugs. absorbent coasters and themed coffee packets. " wish everyone a safe and happy holiday season! Christmas is next on the list. received an answer yet please hang in there!
" Cast your burden upon the Lord, and He will sustain you; He will never allow the righteous to be shaken. "For my iniquities are gone over my head; as a heavy burden they weigh too much for me. "Come to Me, all who are weary and heavy-laden, and I will give you rest. Take My hoke upon you, and learn from Me, for I am gentle and humble in heart; and YOU SHALL FIND REST FOR YOUR SOULS. For My yoke is easy, and My load is light." "GOD TELLS US TO BURDEN HIM WITH WHAT BURDENS US." This quote is from Our Daily Bread - November, 2002 Issue. with inspirational stories, links to Christian music, testimonies, prayer requests, and more! Note: All three patterns are on one page for your convenience. neatly? I would appreciate your help. And thank you very much. same online most of the time. I use a few different edgings for my afghans. ruffled the edge will be. rolled look to the edge. nice look that could be feminine or masculine. may be just what you need... you could join it to the blanket as you go. (1 single per hole and 3 in each corner), then add the edging to that. items tend to get lost in my project bag. Hi! 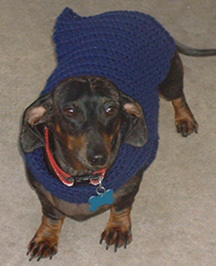 We love your dog sweater pattern and so does our little buddy Rudy! Attached is a picture of him in his new sweater. Thanks for the pattern! Just wanted to tell you how much I am enjoying the newsletter and all of the patterns especially the Hotpad you just do OUTSTANDING WORK Sweetie. I hope you plan on more hotpads/potholders cause I am really into them now especially to make as gifts for family as well as myself. I've made some in the past for friends at our church and now they have asked me to do some for our Craft Fair WOW was I so excited someone loved what I did and wanted more PRAISE GOD !!! Lisa could you come up with an easy pattern for such a square that I call Circle in a Square ? To be made in dc and WW yarn ,I just love that type or even Circular types as well as Hexagon ones . I had friends send me patterns for Cro-Tat but that's WAY TO HARD for me . Oh I'm not asking for you to do it now I know you have so much going on and the holidays are coming up and all, just at your free time whennnnnnnnnnnnnnnn ever that is ha ha :-) . Lisa keep up the fantastic job on the website and all your PRECIOUS TIME you put into it I really appreciate it tremedously. Oh by the way Happy Halloween on Thursday have a safe one. hi lisa, just found this site and i had to tell you that i just love it!! thanks so much for your hard work, i will be a regular from now on!! I just want to tell every one how much I enjoy the news letter I recieve from Crochet'N'More. I have been crocheting for some years now, and still I have never tried to desizen my own patterns. I have just crochet a wedding dress and hope to sell that, but was told that with it being a size 6 it may not sell.At any rate that was my first attempt to crochet anything to wear. Well here I have gotten off the subject. Please keep the news letters coming, Annette Sims in Ms.
them and intend to make more as Christmas stocking stuffers. Thanks alot. P.S. If you have anymore easy crochet patterns please let me know. First of all, i love your web site. Thanks for taking the time! Pat is the abbreviation for "pattern". you were doing before until the designer tells you to work different stitches. I found NO errors with your pattern!!! I just wanted you to know what a hit they were last year for Christmas. I made them for my mom-in-love, aunts, friends, sister and sisters-in-love and they loved them!!! Please know how grateful I am for your expertise. I can follow patterns, but, unfortunately, cannot come up with any of my own. Hopefully, some day, I will get that gift. I've taken up enough of your time. Again, Many Many Thanks!!! 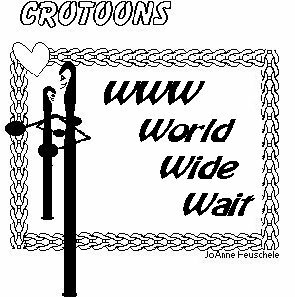 FREE CD-Rom software and "Unbeatable Deals"
on top quality merchandise for the whole family. Our FREE software and new products are perfect gifts for any season. Please enjoy this limited time offer from your friends at Crochet 'N' More. beat the holiday season deadline. Custom orders welcome! Amber Lamps, Amber Jewelry, Unique & Unususal Kitchen & Garden Items. Give something special & different this Holiday Season. Pregnancy Announcement Cards from the BABY! Fetal Greetings lets BABY deliver your exciting news. to let BABY do the talking by inviting guests to his/her own shower. "Yes, he wants to be a garbage collector," replied the boy's father. ambition to have for a career." lock on the supply cabinet. she went to the pastor's study and asked for help. serenely heavenward and his lips moved silently. The kindergarten class had settled down to its coloring books. have any crayons. We don't have any crayons. They don't have any crayons. Do you see what I'm getting at?" "Not really," Willie said, "What happened to all them crayons?" even so he still looked wet and bedraggled. The baker said in astonishment, "Two bagels? Nothing more?" "That's right," answered the little man. "One for me and one for Bernice." "Bernice is your wife?" Asked the baker. I was playing tooth fairy when my daughter, Marina, suddenly woke up. Seeing the money in my hand, she cried out, "I caught you!" she would be unable to cash his check. continued, "our records show your account overdrawn in excess of $5000." "Yes, I am," she answered with a smile, counting out his cash. "But you will notice that your hiccups are gone."